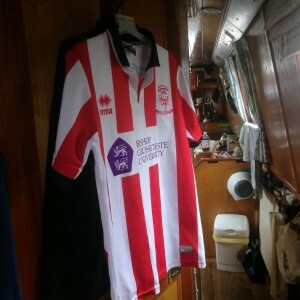 Narrowboating Chick | Last Day of Our Journey and Harebell’s New Mooring. Another sunny day and we pressed on. We were in striking distance of Lemonroyd and were full of discussion about whether to keep going all day and spend the night in our new berth or to stop somewhere on the way and finish the rest of the trip in the morning and head home as soon as we arrived at Lemonroyd. As we were completely unsure about the timings of our journey, we opted for the former; it was the safer option and meant that we could head home without being too late. The electric lift bridges came thick and fast on this last section of the canal, but they were great fun! As we neared Southfields Junction I got keen to see the Aire & Calder, seeing as this would be our “home navigation”. The junction itself was quite pretty with lovely visitor moorings, but the first part of the A&C was a bit uninspiring. 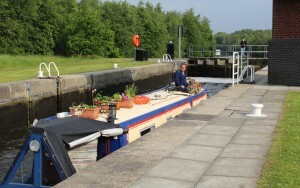 However, as we worked through the locks and got closer to the river sections, it all “preetied” up. 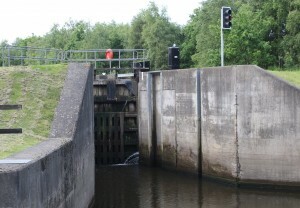 The locks along here were electric and that meant easy cruising and consequently “fast” cruising as well. The wideness of the navigation meant that we were not stuck behind other boats- not that there were many boats to be stuck behind! 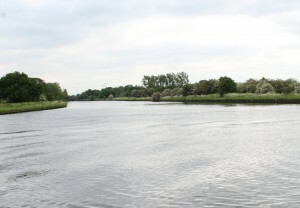 By the time we reached the Aire at Ferrybridge I was hooked! I wanted to turn right at Knottingley junction and head towards Selby, but that would have to be a journey for another day. Onto the River Aire after Ferrybridge Flood Lock. Needless to say, the Aire past Ferrybridge was spectacular! I loved the mix of canal and river sections- the best of both worlds- our time on the Witham obviously converted us into river folk! 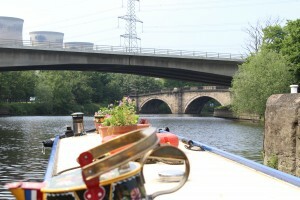 River cruising meant a faster pace and all too soon we were through Castleford Cut and onto the final section of the fabulous River Aire When we brought the car up a few weeks ago, we’d had a look at Lemonroyd lock and it was huge then and it hadn’t got any smaller in the interim period! Anyway, it was the last challenge of the trip and in bright sunshine James & I headed to empty that lock of all those thousands of gallons of water- It took ages!! 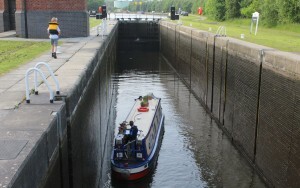 Harebell is not the biggest boat anyway and she looked very small and lost in the bottom of the lock! However, refilling it again was quite gentle and she just bobbed about in the bottom and came gently to the top. The marina entrance was just beyond the top gate and it was in gorgeous weather that had eluded us for most of the trip that we headed into the marina and Marcus steered Harebell into her new berth and the beginning of a new chapter on the Northern Waterways. So lovely to see what you’ve done with her. I right miss that boat! Lovely to hear from you. Have sent you an email.